Follow three-day plans to explore each city. Learn which cities match your interests and which can be easily combined for a longer trip, including itineraries for Amsterdam, Barcelona, Berlin, Budapest, Dublin, Edinburgh, Florence, London, Madrid, Paris, Prague, Rome, and Venice. See the iconic sights Check the Eiffel Tower, the London Eye, and the Colosseum off your bucket list, and use Andy's tips to save time and skip lines. Hit the local hot spots Chill at Amsterdam's coffee shops, study mixology at London's speakeasies, and bust moves at Barcelona's beach clubs. Enjoy the best (and cheapest) local cuisine Graze at boulangeries in Paris, pubs in Dublin, and aperitivo bars in Rome. Become a temporary local Engage with the culture to enjoy authentic, unforgettable experiences. Master digital travel Make the most of your money in Europe with apps and other digital resources. Connect with other travelers Head to the most popular hostels for a ready-made, real-life social network. Andy Steves' Europe will have you city-hopping like a pro in no time. Welcome to our store! We support our operations in part by the referrals generated from the Amazon links below. Collectively, our staff has traveled on the road for dozens of years and this is what we recommend to stock up on before your next adventure. Hover over anything of interest to learn more, and follow the link to Amazon.com for details and to purchase. BLUE YETI MICROPHONE If you're looking for an entry-level microphone to get your own podcast started, this mic by Blue is perfect. Listen to Andy Steves Travel podcast to hear how it sounds! I went for the traveling case so I can travel for on-site interviews with interesting locals and culture experts! BOSE SOUNDLINK REVOLVE+ BLUETOOTH SPEAKER Take your sound game to the next level. Not as portable as my other Bose speaker, but this can fill up a house for a loud party. BOSE MINI SOUNDLINK II My guily pleasure--For the last 2 years, I've traveled with a high-end bluetooth speaker that's great for shower time, park time, and party time! ANKER PHONE CHARGING CASE Anker is a great brand for batteries and phone accessories. Your phone is a great tool to keep from getting lost while on the road, so stay charged with this streamlined case/battery combo. ANKER EXTERNAL BATTERY PACK This external battery comes in very handy on football game days, long travel days, and for that friend who always seems to have a dead phone (I'm looking at you, Eric!). Never go dead with this around, and the two charging ports mean you can charge two phones fast, several times over at once. MOCREO ALL-IN-ONE TRAVEL ADAPTER Plug this bad boy in and charge up to three devices simultaneously from just about any power outlet in the world. RICK STEVES EUROPE UNIVERSAL TRAVEL ADAPTER This all in one plug adapter hugs your prongs nicely and doesn't slip--more than what a lot of other adapters can say. XENVO WIDE ANGLE LENS Take your insta game to the next level with this wide-angle lens. Enjoy the case it comes with and the difuse light, great for food shots. Snap away, young travel jedis. GARMIN FENIX-3 HR MONITOR WATCH If you've got the cash to fork over $350 for a digital watch, and you want to monitor your heading, Barometric pressure, altitude, temperature, heart rate, GPS, calories, and oh yeah, steps, this is top of the line. Teched out for cycling, sailing, golfing, treadmill running, hiking, swimming and even skiing/boarding, you'll love the information it syncs up with online. BOSE SOUNDSPORT HEADPHONES These little guys stay in your ears and deliver top end quality music in a tiny little pacakge. The inline controls let you answer calls, and skip, repeat, fast forward and rewind songs and podcasts while on the go. CANON EOS M10 CAMERA This camera takes DSLR quality photos but without all the bulk. It is only about the size of a point and shoot camera but because of its large sensor it takes gorgeous photos and video and is really easy to use. ANKER QUICK CHARGE DUAL WALL CHARGER Plug in multiple phones at once into this wall charger when you're poorly made Apple brand charger breaks. NIKON D7000 DSLR Collect memories in HD with this beast of a camera from Nikon. Famous for their lenses, user friendliness, and high quality images, Nikon DSLRs are a great entry point into the world of travel photography, and I like this one! CANON 'PANCAKE LENS' This lens is really small and with an aperature of 2 it does a great job in low light and taking photos with selective focus. BELKIN AUDIO & CHARGE PLUG iPHONE ADAPTER With Apple's latest update, consumers are forced to carry an adapter or throw away perfectly good headphones. Get this plug in to get a charge while listening to music and making calls at the same time. Without it, you'll have to choose between charging or listening to music. It does beg the question, What Would (Steve) Jobs Do? FITBIT CHARGE HR MONITOR I put in a million steps updating the last edition of my guidebook thanks to fitbit technology. Track resting heart rate, sleep quality, steps, calories and more with this fashionable wearable tech Pheidippides could only dream about. ANKER LONG CHARGING CORD You wouldn't believe how handy it is to have a long charging cord for your iphone. Wall outlets in Europe never line up to exactly where you need them, so a few extra feet goes a long ways! We like to be light and nimble on the road so we take special care on what and how we pack. RICK STEVES EUROPE ROLLING CARRY-ON BAG This roller bag is the perfect size--allowing me to take just what I need and still easily fitting in even the smallest Euro overhead bins. You'll have to be disciplined for extended trips, but it's doable! PACSAFE VENTURE SAFE 25L DAY BAGS Pacsafe's proprietary anti-theft technology means no one will be able to scan your cards, cut your straps or run off with your bag during your adventures. FREE KNIGHT DAY BAG Light weight, affordable and discrete--all the things I look for in a day bag. I use this primarily to keep my 'office' organized while on the road. HERMITT EVA PROTECTIVE CASE This is my choice to pack around my Blue Yeti microphone as I record my podcasts while traveling. OSPREY 65L ATMOS BACKPACK I've been using and abusing the 2010 version of this bag from Osprey 8 months/year and she's holding up great! Osprey stands behind their products, and theiur leightweight materials means you're not lugging around weight to lug around weight. OSPREY PORTER 30L TRAVEL DUFFEL This backpack fits so much for its size and it has a waist strap to help distribute the weight to your hips which will save you from a backache. Plus unlike some other backpacks you never have to worry about a budget airline making you check it because its too large. MUDDER CARRYING CASE If you spring for the Bose Blutooth Mini II speaker, don't forget this well-fitting travel case. I leave the plastic cover at home, and travel just with the soft hard case. LA REINE DRAWSTRING BAG When it comes to bags, I like low key and discrete. Great for a trip to the gym, a light, simple day bag, or to carry your laptop without anyone knowing the better. RICK STEVES EUROPE SECURITY POUCH This discrete little pouch blends into the bottom of any bag, and is great for cash, random cords, extra coins etc. These are some of our favorite accessories to keep life cool and comfortable while on the road. CARRERA 91/S SUNGLASSES Get truly Euro, and blend in with the Roman bus drivers with these classy shades. BLACK DIAMOND HEADLAMP I love this headlamp for its lightweight and bright light. If you're heading anywhere where you might need a flashlight i.e. anywhere outside of Europe, this is a great option. RICK STEVES EUROPE TOILETRY BAG This spartan toiletry kit is just what I need to carry my toothbrush and paste, a few vitamins, razor, and a bit of styling wax. EAGLE CREEK COMPRESSION BAGS I love these compression bags to squeeze every last ounce of air out of your clothes. I was skeptical, but after my first use, my eyes were opened to this simple, space-saving technology. I'm glad I tried them! KIVA TRAVEL CLOTHESLINE This clothesline has velcro straps at either end and stretches to 6 feet which makes it easy to hang it wherever you are. The line is braided and elastic which means you don't need clothespins and it packs down very compactly. 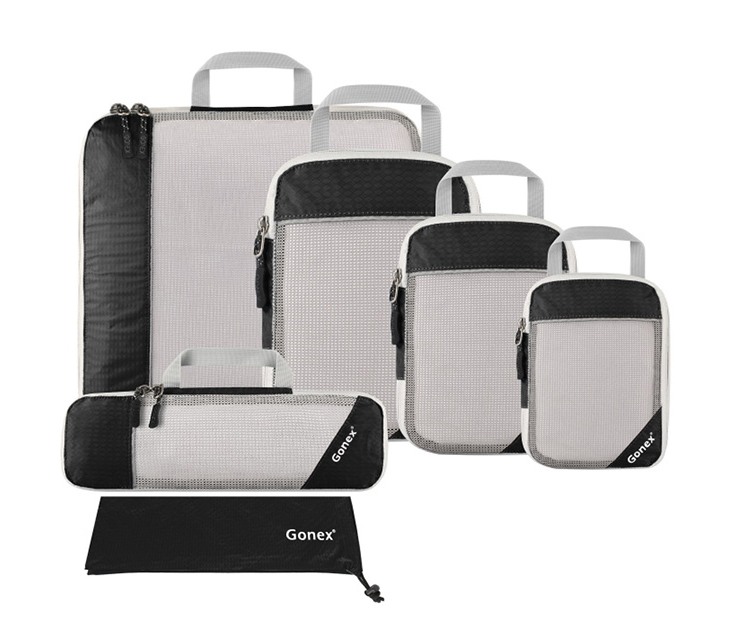 GONEX PACKING CUBES These work wonders to help you pack as much as possible, keep your things organized as you move from place to place, and they come in a variety of sizes and colors. KOLUMBO TSA COMBO LOCK TSA gets into everything, and this lock allows them to open the bag with their proprietary key, and only returns it when the device is relocked. This lock is also clutch for easy sleeping in hostels and while on night trains. It's crucial to layer clothes while traveling in order to stay warm without packing too much. Always make sure the clothes and items you pack are versatile and can go well with all the other clothes you're bringing. You don't want a beautiful, colorful jacket that only jives with one pair of shoes and/or pants! ARC'TERYX MEN'S BETA RAIN JACKET Ain't no water getting in with these taped seams and toughlight-weight material. Great for layering. HUDSON MEN'S SKINNY JEANS Blend into the crowds with these Euro-style darkwash skinny jeans. Dress up or down with these versatile pants. ARC'TERYX MEN'S ATOM LT JACKET Stay warm and travel light with this excellent all-weather midweight jacket. I've loved mine for years. WRIGHTSOCK COOLMAX DOUBLE LAYER RUNNING SOCK Lightweight double layer socks keep your feet dry and blister free (for the most part) on those long sightseeing days. NEW BALANCE 1400v5 RUNNING SHOES Lightweight and well fitting, these are my all-purpose running, walking, hiking, working out, and every day shoes. I go through one pair about every 6 months. DIESEL MEGA CHIEF WATCH The compliments never stock coming when you rock a chunky Diesel watch. LACOSTE MEN'S CHAYMON SHOES Nothing suclks worse than getting turned away at the door because your shoes don't fit the part. Go euro with Lacoste to better blend in. SMARTWOOL LONG UNDERWEAR BOTTOMS If you're traveling in winter, you've gotta bring long underwear to stay warm. I go with Smartwool. SMARTWOOL LONG UNDERWEAR 1/4 ZIP TOP Smartwool tops the others in comfort and style. Stay toasty all day with thise well-fitting, high quality long underwear made from 100% wool. I'm aware that my recommendations are woefully dude-specific, so I've enlisted the help of my female friends, colleagues and family and they whole-heartedly recommend these accessories and items for your next adventure. AERIS NECK PILLOW Head rocking is really only fun at concerts, not on planes. Arrive fresh and ready to go with my favorite neck pillow. The breathable material on the pillow, eye covers and ear plugs will block out all the noise and send you off to vacation dreamland in no time. CACALA BATH TOWEL This is an amazing towel that can double as so many other things. It absorbs even better than terrycloth but without all the bulk and it dries very quickly. When unfolded its pretty large and can double as a blanket, beach towel or even sarong. Best of all it folds up to take up no more space than a tshirt! BUMBLE & BUMBLE DRY SHAMPOO Dry shampoo is a great way to keep your hair looking and smelling fresh when you travel without needing to shampoo every day but most of the best ones are aeresol and the travel sizes run out within a week. This one is great because it’s a powder and it has a hair volumizer in it as well to keep you looking your best. EBAGS PACK-FLAT TOILETRY KIT This toiletry kit helps keep everything organized and fits a lot, but its very thin which makes packing it much easier than other toiletry kits. It has 4 compartments including one that is plastic lined and it has a hook for easy hanging.